Within in our own community, we are acknowledging an amazing milestone as well. Fr. John Blazek ’58, C.S.C. is celebrating his jubilee — 50 years of ministry as a priest. 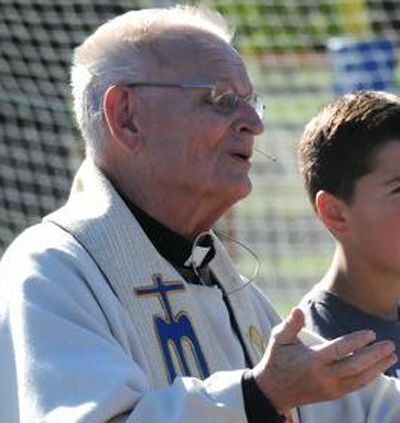 The contributions he has made to Gilmour Academy as a minister and a member of our community are difficult to articulate in words or to honor in a celebration, but we are going to try our best. On Friday, September 15, Gilmour Academy’s Founder’s Day, we have a very special day planned for the community, filled with events honoring Fr. John and our Holy Cross family, including a special Mass for students and their families at 9 a.m. at Weber Stadium. Please join us! Blessed Basil Moreau explained that “an education that is complete is one in which the hands and heart are engaged as much as the mind.” By engaging our hands, heart, and minds, the students, faculty and staff will be working together to create the stepping stones for our Journey of Hope Prayer Garden, which will honor the 144 religious who have served at Gilmour; Skype with the Holy Cross Brothers in Ghana; write letters to members of the Holy Cross community around the country; and much more. It will be a day for our community to pause and reflect on the global Holy Cross community of which we are a part.